Guiseley's Alex Purver and Fleetwood Town's Ched Evans battle for the ball. GUISELEY midfielder Alex Purver is urging the wounded Lions to cast aside their FA Cup disappointment by ‘hitting the ground running’ during a busy festive programme of games. 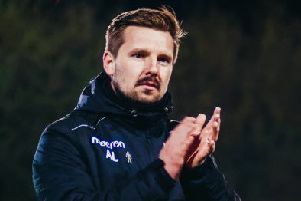 The Cup party may be over for Guiseley following Monday evening’s second-round loss to Fleetwood Town in front of the TV cameras at Nethermoor, but a run of at least seven games over the next month will ensure that their attentions will quickly switch. Guiseley's Alex Purver celebrates scoring against Fleetwood Town. The Nethermoor outfit kick off a busy run with a National League North appointment at home to Hereford FC tomorrow – followed by a midweek FA Trophy replay with Lancaster City on home soil on Tuesday evening. Following the hype and hullabaloo of the Cup, the return to the ‘bread-and-butter’ of the league may be viewed in some quarters as a bit of a reality check for the Lions. But former Leeds United midfielder Purver, who scored an impressive goal in the 2-1 round two defeat to Joey Barton’s Fleetwood, is embracing a return to league business as he and his team-mates make up for lost time. First up is the visit of 18th-placed Hereford, two places below the Lions and hovering just above the relegation zone. While Guiseley are looking upwards, they are also mindful of the gap beneath them too, with the importance of not being dragged into a prospective relegation fight by the start of the new year likely to heighten extra focus. 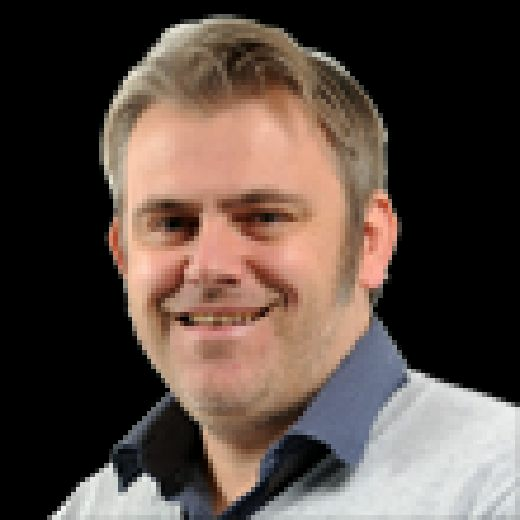 The next month also sees Guiseley visit relegation-haunted Nuneaton Borough, but they also face a tough Christmas and New Year double-header with promotion-chasing Bradford Park Avenue – managed by former Nethermoor chief Mark Bower – and will also host a firm play-off candidate in Altrincham. On returning to league duties, Purver said: “It has felt like a long time since we played in the league and I am dying to get back to the league. “We are in a position where we do not feel it replicates to how we have played so far this season. Purver’s sense of relish and positivism is likely to be applauded by the club’s management team of Marcus Bignot and Russ O’Neill as minds are refocused towards the league. Lessons, good and bad, will be taken from the club’s Cup odyssey, according to Bignot, as the club switch attention back to the priority business of the National League North. Bignot, whose side will be watched tomorrow by considerably fewer than the 2,324 who turned up for the club’s marquee Cup appointment on Monday, observed: “I know deep down, it (the Cup run) has been a huge success on and off the pitch for us. Ultimately, the league is where we are going to be judged and it is important that we use these experiences and losses to learn from them. Elsewhere, leaders Park Avenue – three points clear of Chorley, who do have two games in hand – play host to lowly Southport tomorrow.